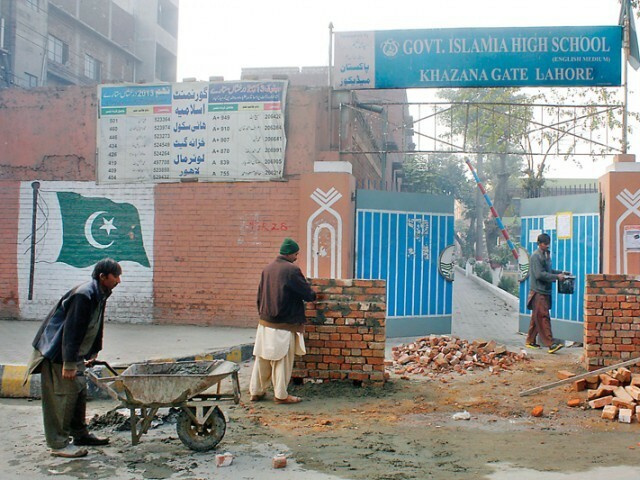 Govt instru­cts school­s to raise bounda­ry walls till 8-feet and place two-foot barbed wire on top of them. Winter vacations are over and all schools in the province are set to open on Monday (today). Vacations had been extended for all schools to beef up security following the December 16 attack at the Army Public School in Peshawar. Following the attack, the government instructed schools to raise boundary walls till 8-feet and place two-foot barbed wire on top of them. They were told to hire trained security guards and assign one gate for entrance and exit. Earlier, Education Minister Rana Mashhood Ahmed Khan said only 46 educational institutions in the province had failed to complete their security arrangements in accordance with the SOPs issued to schools. He said the government would ensure security at the schools and ensure that all schools reopen on January 12. The Punjab Teachers’ Union had also recommended that scout training be declared compulsory for students of grades 8, 9 and 10. They said the government should not hold end-of-year exams for at least three months. Antecedents of staff working at canteens at schools should be verified and no vendors should be allowed to sell edibles in front of schools. Published in The Express Tribune, January 12th, 2015. As many as 8,798 schools in Dera Ghazi Khan division have been advised not to reopen. A ‘panic button’ would be placed at all schools, these have already been installed at schools in Cantonment.